When archaeologists started to dig into the Roman history of Zeiselmauer in the late 70ties of the last century, the remains of the surviving fortification walls were believed to be of medieval origin. It turned into a real archaeological sensation when a very well preserved late antique fortlet with high and meighty walls emerged after the demolition of several old houses and sheds lived in by the local inhabitants throughout centuries. The discovery of a 20 x 21 m square building with 1.9 m thick outer walls, three stories and a small courtyard in the center is a unique but clear testimony how the Roman army maintained their frontier defense with a reduced garrison of 60-80 soldiers in the late 4th century AD. 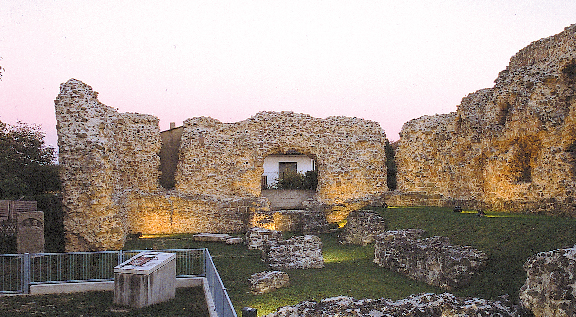 The small town of Zeiselmauer is dominated by the extraordinary well preserved fortification monuments of late Roman origin which are well looked after and promoted by the local historical society. Visitors are guided to the individual monuments by a small path, leading them from the medieval church in the central square, where the remains of the headquarters building are preserved in the basement, to the eastern gatehouse called „Körnerkasten“, the northeast corner tower inside a private garden and the fortlet. Detailed panels outline the complete fort structure, its reconstruction and history. Roman legions from the neighbouring province of Pannonia surveyed and helped to construct the most eastern fort in Noricum at the end of the 1st century AD. A stone altar dedicated in 164/65 AD by the Cohors II Thracum to the Emperor Lucius Verus gives clear evidence that the troop in residence was partly composed of horsemen, who helped to control the wide plains of the Tullnerfeld and the flat countryside north of the Danube. After their resignation from the army service those soldiers married local women and lived in the neighbouring civil settlement indicated by their Celtic names on tombstones from the cemetery. At the beginning of the 4th century new soldiers had to rebuilt and strengthen the fortification walls and towers in Zeiselmauer, a mission entrusted to the army all along the Danube frontier by Roman Emperors. This defense strategy was directed to survive numerous conflicts and fight back mayor martial incidents with the Barbarian tribes trying to raid and conquer Roman provincial territory. Finally the army was forced to reduced their fort size and the garrison which already included Barbarian mercenary soldiers before it was given up completely in 488 AD.